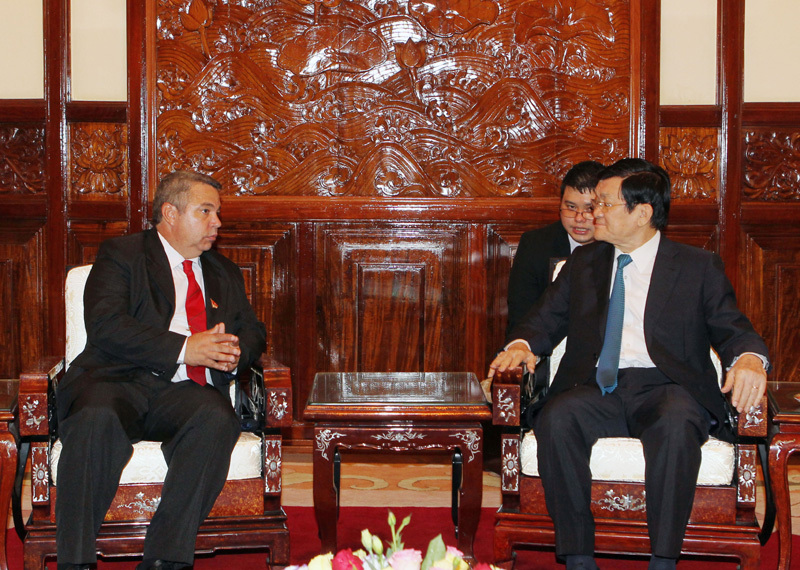 HA NOI (VNS) — President Truong Tan Sang met Secretary General of the centre for Workers of Cuba (CTC), Ulises Giularte de Nascimiento, in Ha Noi yesterday. During the reception, Nascimiento thanked the Viet Nam Communist Party (CPV), State and people for their support of Cuba and updated the President on the results of his meeting with the Viet Nam General Confederation of Labour (VGCL). The guest delegation requested additional experience exchanges with Viet Nam in attracting investment and trade union activities in industrial zones and non-state businesses to fulfil current Cuban development objectives. President Sang reiterated the close co-operation between Viet Nam and Cuba at regional and United Nations forums, and praised the special friendship between the two nations.